Gujarat National Law University (GNLU), Gandhinagar is one of the premier law universities bearing the unique distinction of a being a National Law University. The University was established under the Gujarat National Law University Act, 2003, a statutory legislation passed by the Government of Gujarat. Introduction of Y.J. Trivedi & Co.: Y.J. Trivedi & Co. started functioning since 1970 and the firm exclusively handles IPR related issues and litigations, for which it has earned a top ranking status. In order to meet its vision of creating awareness about IP rights in the society and to encourage innovative creations in the IP field, the firm conducts various seminars, programmes etc. with the help of academic and non academic institutions. Protection of well known marks in India: Does it need Rethinking? Protecting confidential information: Need of the hour? The winners will be intimated personally as well as uploaded in the GNLU website. Essays must not be longer than 3,000 words. It must be accompanied by an abstract of not more than 300 words. The abstract will be used by the jury to make a pre-selection. Kindly, enclosed all the three documents (Cover Page, Abstract and Essay) in one Doc file. All submissions must be in Times New Roman, 12 Font Size, 1.5 Line Spacing and Headings/Titles must be in Capital. Quotes and references must be clearly marked throughout the essay (preferably in italics) and properly cited. Any method of citation can be followed but is required to be consistent throughout the text. Submissions can only be made online, in English. All submissions are to be electronically mailed ONLY to ipeassy@gnlu.ac.in. Entries will be accepted only in MS WORD. PDF format will not be ACCEPTED. The identity of the author is not allowed to be indicated anywhere in the text. References to specific individuals, firms, or schools, which might reveal the author's identity are strongly discouraged and shall be liable to be disqualified without any refund of the registration fees. Entries should be accompanied by a cover page with the author/s name, mailing address, telephone, fax numbers, and e-mail address; name, address of the institution where the student is enrolled, year of study. It is MANDATORY to register the entry by registration link available on the website. Essays will be judged on the basis of its content, lucidity and originality. The quality of analysis meticulousness of research will be considered in its comprehensiveness. Other aspects of quality such as rationality, approach, structure and innovative application will be other parameters of evaluation. The entries will be judged by jury of leading law academicians, jurists and law practitioners from across the world. The committee is free to determine its own method and system of analysing and judging the essays and has absolute discretion of selecting the essays. The decision of the committee will be final and binding. Last date of submission is 26th February, 2015. Any entry after the prescribed date shall not be entertained. Participant should not submit more than one entry. Joint Authorship is allowed, but it should not exceed two participants. All submissions must be original. No previously published material will be accepted. Any entry of plagiarism will result in automatic disqualification. All essays received in the competition become the property of GNLU-Y. 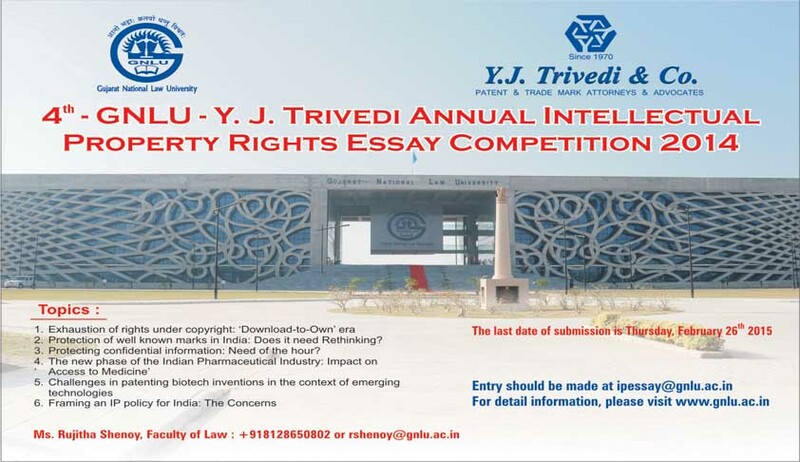 J. Trivedi Annual Intellectual Property Rights Essay Competition, which reserves the right to publish the essays in any form – electronic or print. The contestants by entering in the contest give GNLU – Y. J. Trivedi Annual Intellectual Property Rights Essay Competition the right to publicise the winning entries without any royalty or compensation. The contestants by entering in the competition agree to indemnify GNLU – Y. J. Trivedi Annual Intellectual Property Rights Essay Competition from and against all claims, suits and damages based on any claim of copyright infringement or plagiarism or unauthorized use. Neither GNLU – Y. J. Trivedi Annual Intellectual Property Rights Essay Competition nor will the committee be responsible for any condition beyond its control that may cause the contest to be interrupted. The decision of the Jury shall be final and will not be subject to an appeal. 4th GNLU – Y. J. Trivedi Annual Intellectual Property Rights Essay Competition shall take no responsibility in any matter arising out of any dispute as regards the authenticity of the submitted work.